Bus from KL to Tangkak is the only public transportation connecting the capital and the town in Johor Bahru. Because there are no airport and train station at Tangkak, local commuters rely on the bus service to travel from KL to Tangkak. KKKL is the operator serving bus from KL to Tangkak. KKKL provides hourly departure from TBS (Terminal Bersepadu Selatan) starting from morning 8:30 to evening 17:30. With these frequent schedules and consistent quality service over the years, KKKL becomes the favourite choice of local commuters travelling from KL to Tangkak. The bus fare for bus from KL to Tangkak is maintained at affordable price of RM 16.00. Travel duration from KL to Tangkak takes about 2 hours depending on traffic condition. Washroom break will be provided upon request to driver during the journey. TBS (Terminal Bersepadu Selatan) is the terminal to serve for this south bound KL to Tangkak route. TBS is an air-conditioned and fully-integrated multi-storey bus terminal. Apart from being the transportation hub, TBS is equipped with convenient stores, food court, fast food chain and restaurants. With the variety of food choices, passengers can dine in at TBS before boarding. 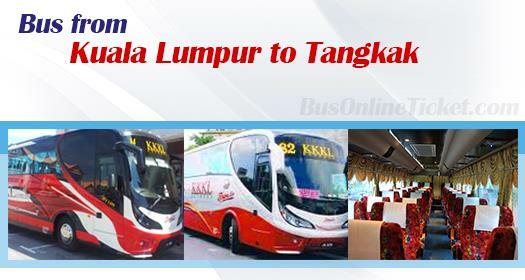 With the limited transportation option to travel from KL to Tangkak, commuters are advised to booking online in advance with BusOnlineTicket.com for bus ticket. Your booking in BusOnlineTicket is instantly confirmed upon payment. Hence, this reliable online booking service is convenient and hassle-free.